Ranger Tugs R-23...a true Showstopper! Save on our last 2018 Ranger Tugs R-23 Hero Red stock boat! SAVE BIG ON OUR LAST 2018 R-23 !!! We have two hull colors in stock; 2019 Midnight Blue (sister ship photos shown) & 2018 Hero Red (Save $5,000). Call us now for details! The Ranger Tugs R-23 is featured in the June Edition of Lakeland Boating Magazine! We all like to read authoritative articles featuring boats we admire, especially when they are locally focused. Lakeland Boating Magazine brings important news, reviews and photography of the Great Lakes boating scene, and for their June edition, they showcase two of our most exciting new boats, the Ranger 23 shown on this page and the Mag Bay 33 located on this website as well. Find out why this new model from Ranger Tugs is such a hit and click the article link below. Our Ranger Tugs R-23 on Spring Lake - February 23rd! We took advantage of the beautiful February weather and launched our in stock 2017 Ranger Tugs R-23 on February 23rd. She ran great with a top end of 38 mph with full fuel and 4 people on board. We experienced a nice cruise speed of 28 mph getting an efficient 2.8 miles per gallon. This one has sold but make an appointment to tour a 2018 model today! The new Ranger Tugs R-23 is a much-anticipated addition to our award-winning lineup of Ranger Tugs. 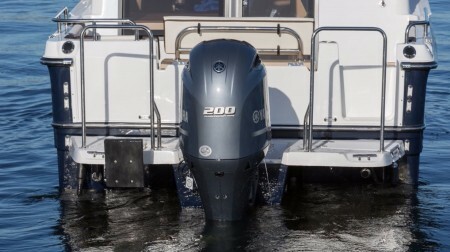 Powered by a standard 200 HP Yamaha outboard, the R-23 bridges the gap between our popular R-21 EC and R-25 SC models. The first thing you will notice when looking at the new R-23 is the dramatic, curved windshield and visor, which is emphasized by several overhead skylights. There is no shortage of light or visibility onboard the R-23, which incorporates four opening roof hatches, sliding side windows, and an opening glass bulkhead, providing a very open and airy feeling inside and out. Opening portlights also allow for a nice cross breeze in the cabin. The forward cabin on the R-23 has plenty of room for sitting around the teak table, separate sleeping for two or sleeping two together with the filler-cushion. The mid berth is great for kids or storage, and the dinette converts to a sleeper as the third berth. The well-appointed galley on the R-23 is standard with refrigerator/freezer, cooktop, and microwave. The forward head includes a marine toilet with holding tank, shower, sink, and mirror. To scroll the thumbnails, please pause the slideshow. 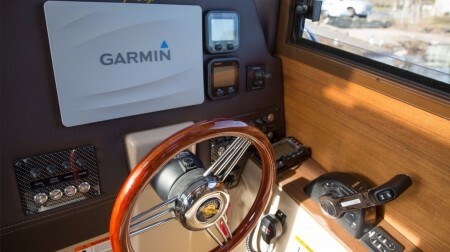 The Ranger Tugs R-23 is standard with Garmin 7610 GPS with Depth Sounder/Fish Finder and available with optional HDX radar. VHF to stay in touch, illuminated compass, cabin nightlight, cockpit and exterior side trail lighting, and our patented built-in safety trailering lights (brake, turn, and reverse) are all standard equipment making the R-23 ready to cruise. The cockpit on the R-23 is built to fish and ready to entertain with standard rod holders, optional downrigger pads & outlets, a folding double seat, and cockpit table. The R-23 is perfect for overnighting or extended cruises. It incorporates many of the same amenities as a larger cruising yacht that until now were not offered on a boat of her size and price point. Whether you are new to boating or a seasoned captain, the R-23 is the perfect boat for your next adventure. Get on the water today in the new Ranger Tugs R-23!